Using C#.NET Barcode Creator Add-on of RasterEdge DocImage SDK for .NET, you can easily integrate fast & accurate Intelligent Mail (OneCode) barcode generating features into C#.NET imaging applications. This professional and 100% clean Intelligent Mail (OneCode) barcode generating SDK allows C# developers to generate Intelligent Mail (OneCode) barcode and draw created barcode on various image files (like GIF) and common document files (like PDF). Written in managed C# code, this .NET Intelligent Mail (OneCode) barcode generation solution owns fully-featured functions for barcode generation on images and documents. Please look at the benefits of RasterEdge Visual C#.NET Intelligent Mail (OneCode) barcode creator add-on. You can easily generator Intelligent Mail barcode and save it to image files/object using this C#.NET barcode generator control. The following steps will show how to create a Intelligent Mail type barcode encoding numeric data text "01234567890123456789" into the image object with XImage.Barcode.Creator. 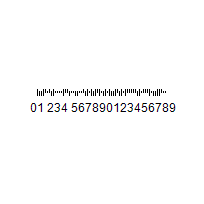 Please copy the sample code as follow to generator a Intelligent Mail barcode. RasterEdge .NET barcode generator control owns high compatibility with common C#.NET image managing applications. Using this C#.NET Intelligent Mail (OneCode) barcode creator add-on, developers can not only draw an Intelligent Mail (OneCode) barcode on png, gif, jpeg and bmp image files but also accurately specify the generation area where the linear barcode will be created. This Barcode Creator Add-on for C#.NET class applications can help developers easily integrate advanced Intelligent Mail (OneCode) barcode generating functionalities into your C#.NET document processing projects. The document types that are supported by this C#.NET Intelligent Mail (OneCode) barcode generating and inserting SDK are TIFF, PDF, Word, Excel and PowerPoint. The C# code demos listed below will help developers finish barcode generation tasks programmatically: specify a page from source document file, create a high-quality Intelligent Mail (OneCode) barcode image and insert created Intelligent Mail (OneCode) barcode into selected document page (with defined location). The following C# sample code illustrates how to create a customized Intelligent Mail (OneCode) barcode and add generated barcode to a png image file within C#.NET application.